Content creation has never been so diverse or complex than it is today. With so many ways to be seen and heard, no wonder a majority of us fixate on likes and shares as a way of validating our worth among the masses. This kind of thinking breeds insecurity, and can often pull us away from the long term goals that we want from our podcasts. 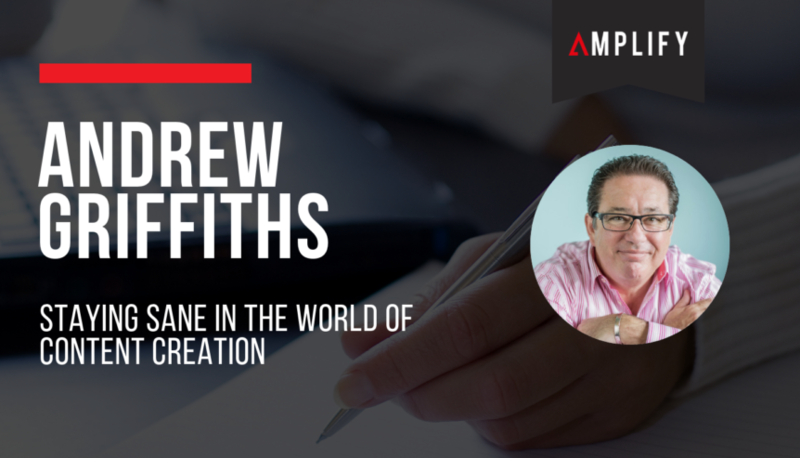 On a recent episode of Should I Start A Podcast, we shared the enigmatic Andrew Griffiths’ keynote speech on How To Stay Sane in the Insecure World of Content Creation. In it, he shared with us some great approaches to staying on target, keeping relevant and casting out those inner and external demons. Andrew is an avid proclaimer for a good plan, and advocates thinking about your brand in the long-term, rather than just year to year. If you mentally envision yourself continuing with your podcast for decades, you are seeing it as a continuing business, and will begin to motion towards creating content that will stand the test of time. Create a two year plan, then you can see where you want to manoeuvre your podcast to, and evolve with time. You should know that your audience is at the very heart of your podcasting success. If they’re not beating their drum for you, you will start to dwindle away. While “likes” and “shares” are great, they are only temporary wins. What would be better is to have a mob behind you, to guide your business in the right direction so you can create better quality and valuable content. Encourage a discussion by adding a call to action that gets your audience telling you exactly what they want. Make sure to read your comment sections, and take note of messages that come your way through social media. By doing that you will begin to produce higher quality content, as well as creating a community of watchdogs to keep you in check. If you’re looking to stay in the podcasting realm for the long-term, you’re going to write and produce things that are meaningful to you. The unfortunate side that comes with the content creation territory is you will get a hater at some point. That person who sends you an anonymous email calling you all kinds of unflattering things, that you smell and your show is the worst thing to have graced their ears. However anxiety inducing this may be, take this opportunity to reprogram your thinking. Dust yourself off and understand they are not your audience – they’re not the ones you care about, and it’s their issue not yours. Focus your attention towards the people that are waving your banner, and want you to succeed. Just remember, with some good planning, involving your audience and dispelling extreme negative behaviours you’ll start recognise your worth and quell any insecurity that may rear up from time to time. To catch more of Andrew’s talk click here.